This is a belated birthday post for E.S. 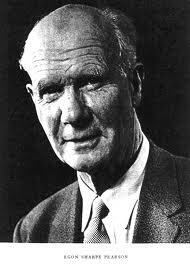 Pearson (11 August 1895-12 June, 1980). It’s basically a post from 2012 which concerns an issue of interpretation (long-run performance vs probativeness) that’s badly confused these days. I’ve recently been scouring around the history and statistical philosophies of Neyman, Pearson and Fisher for purposes of a book soon to be completed. I recently discovered a little anecdote that calls for a correction in something I’ve been saying for years. While it’s little more than a point of trivia, it’s in relation to Pearson’s (1955) response to Fisher (1955)–the last entry in this post. I’ll wait until tomorrow or the next day to share it, to give you a chance to read the background.